Grande Stream Profi Swimming pool equipped with counter-current system and overflow channel Available in different sizes. Grande Stream Profi S Swimming pool equipped with counter-current system and skimmer Available in different sizes. Grande Unique Stainless steel pool with skimmer Available in different sizes. Swimming pools offer you the option of an integrated housing for an automatic cover, which will allow you to keep your pool clean, safe and warm all year round. MdP Unique offers pools of elegant, cutting-edge design. Designed for maximum functionality, they include steps for easy access and a bench to relax on whilst allowing the use of the whole pool. 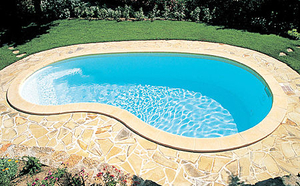 The one-piece or monobloc swimming pool is a prefabricated in-ground model. Such pools are essentially for private yards, though they are occasionally found in public or hotel settings. These pools are factory-molded in a single piece, ready to be placed in the ground. They are usually made of fiberglass covered by polyester or vinylester resin, the latter being more durable but more expensive. It is also possible to find shells of steel. Choice of a one-piece pool will depend on available space and intended use, be it swimming, cooling off of another activity.